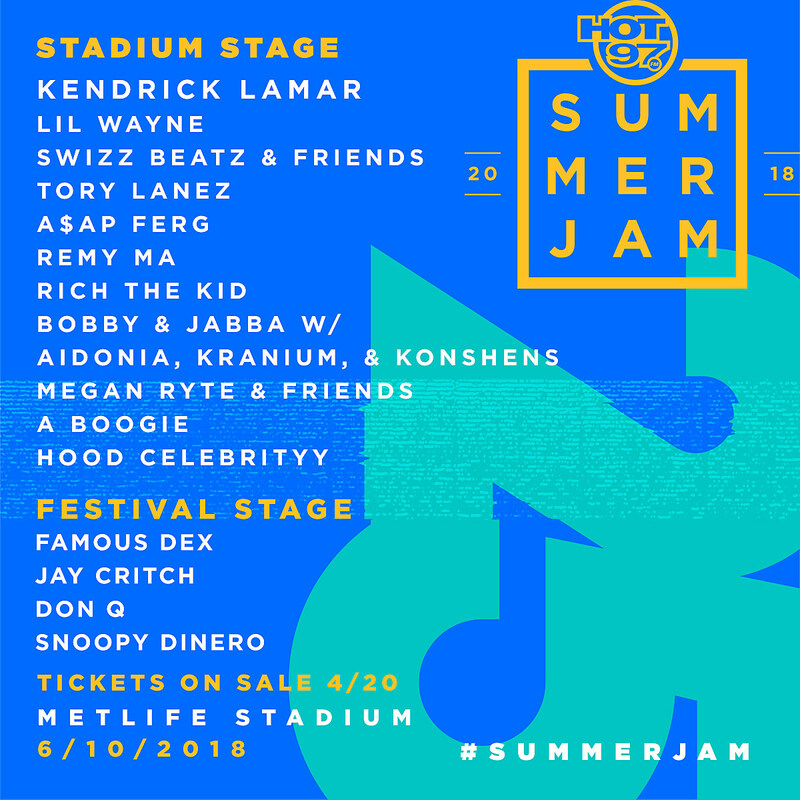 The annual Hot 97 Summer Jam returns for its 25th year on June 10 at MetLife Stadium in East Rutherford, NJ with headliner Kendrick Lamar (who also headlined in 2015 and played both the main stage and side stage in previous years). The main stage (aka the Stadium Stage) also includes Lil Wayne, Swizz Beatz & Friends, Tory Lanez, A$AP Ferg, Remy Ma, Rich The Kid, Bobby & Jabba (w/ Aidonia, Kranium, & Konshens), Megan Ryte & Friends, A Boogie and HoodCelebrityy. The side stage (aka the Festival Stage) includes Famous Dex, Jay Critch, Don Q and Snoopy Dinero. Tickets go on sale Friday (4/20) at 10 AM with various presales beforehand. Earlier today, Kendrick became the first rapper to win a Pulitzer Prize. The award went to his 2017 album DAMN. Kendrick is also going on the TDE full roster tour, which includes MSG and Jones Beach in May.